Following TPLO surgery, many pet owners may find themselves navigating the recovery process with their dog. Here are some tips to help you through the TPLO surgery and recovery. 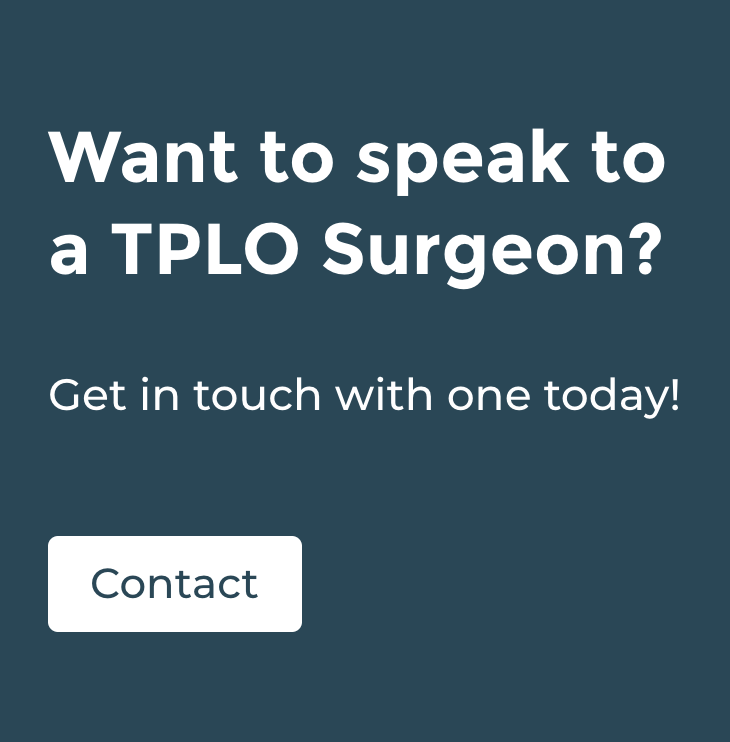 Understanding the TPLO recovery can help make the entire process more manageable. Before arriving for surgery, prepare a recovery area at home so it’s ready when you return. If your pet is crate trained, this can be an excellent recovery area. If not, try to utilize a small area of the home such as an office, closet, or restroom. Ideally, you want to avoid an area with slick floors such as tile, wood, or linoleum. It is also important that the space doesn’t contain furniture your pet may be tempted to jump on. 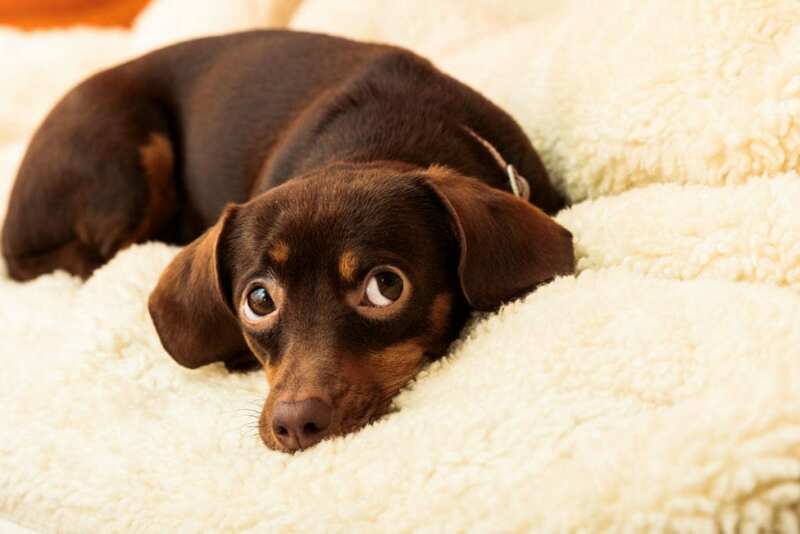 You may place a dog bed or blankets on a floor to make a comfortable space. Having their food and water nearby can also help reduce the amount of movement required in the first few days. One of the biggest struggles owners may have after surgery is deciphering if your pet is in pain. It takes time for patients to fully recover from anesthesia and it can be difficult to determine if your pet is in pain or is dysphorically associated with anesthesia. Every effort will be made to ensure your pet is comfortable during the recovery period. In addition to the analgesic medications, your pet will receive the day of surgery, you will likely be sent home with more than one pain medication to help address any discomfort in the days following surgery and these medications can make patients sedated. Monitor for signs such as hiding, whining, increased breathing rate or pain when touching over the incision site. Keep in touch with your veterinarian if you are concerned your pet is painful. The main thing to remember is to follow the TPLO discharge instructions provided by your surgeon. Excessive activity too soon during the recovery can lead to pain and discomfort. 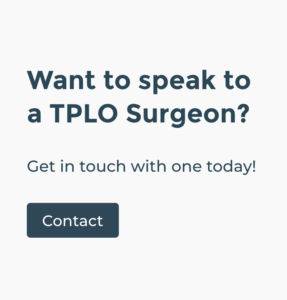 One of the most important things a pet owner can do during the TPLO surgery recovery is to prevent your pet from licking or chewing at the incision site. This activity may be the leading cause for surgical site infections. There are multiple types of collars (E-collars) that can be used to prevent your pet from licking the surgical site and some may work better for certain pets. Please speak with your veterinarian prior to picking your pet up after surgery to make sure an E-collar will be provided. If not, you may purchase one from your local pet store. It only takes a few seconds for a pet to remove their sutures – it is extremely important this is on at all times when your pet is not being directly monitored. Some pet owners also find that a sling can be helpful during the immediate post-operative recovery process. A sling (or a folded towel) can help lift or help support your dog if they are having trouble standing on their own. Typically, this is most important for pets that have to walk across a slick surface or for pets having TPLO surgery performed on both legs at the same time. You don’t need to completely lift your pet up with the sling – you are just there to provide support and a safety net in case your pet falls. No matter how hard you try to follow your veterinarian’s TPLO recovery plan, it’s not always going to go by the books. Owners have the difficult task of keeping their pet calm and preventing high-impact activity once they have made it through the first few days following surgery. This is easier said than done, and we understand that. Our biggest concern is that your pet makes a complete recovery. It is important to understand that the more active a dog is during the initial recovery, the higher the potential risk of complications. Thankfully, the implants used for this surgery are very strong. Please do the best you can to follow the exercise restriction guidelines following surgery. It’s important to remember that every dog recovers differently following surgery. Taking the time to understand the components of the recovery process will help make it easier.